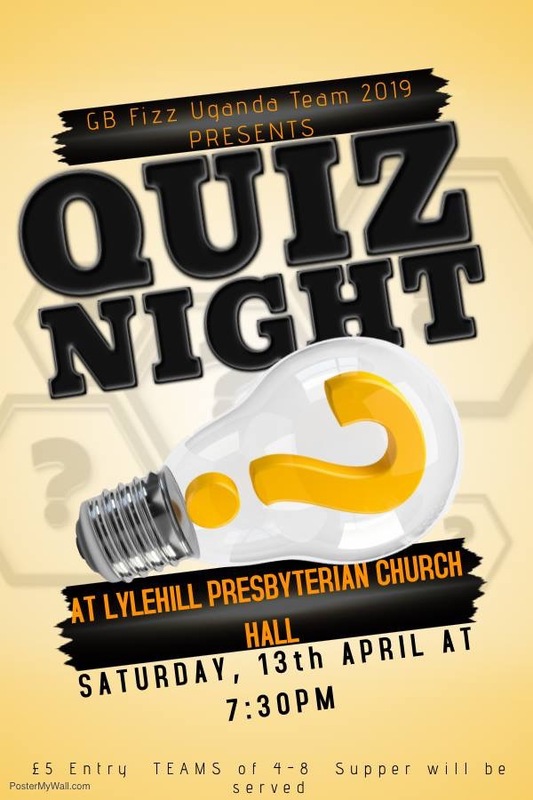 A fundraising Table Quiz at Lylehill Presbyterian Church will help to raise money for a team who are going to Uganda this summer. It will be on Saturday 13th April 2019 starting at 7:30pm. “When we are over there we will be teaching children from two schools, one of which is Grace Christian primary school. Whilst there we will be teaching Bible stories, the I AM Girl project and playing games with the children. The stories we have chosen are about empowering women. We are also being given the opportunity to watch drilling”, added Megan. Saturday 13th April 2019 starting at 7:30pm. Entry to the quiz has been set at £5 per person and supper will be served. Lylehill Presbyterian Church is located at : 90 Lylehill Road, Templepatrick BT39 0HL. For more information about the church, log on to their website here or find them on Facebook here.